The Story through Laos, Vietnam, Cambodia and Thailand. Where did all the tumbleweed come from?! Sorry my updates have been a little but non-existent for a while. Truth be told, a lot has happened in not a lot of time and blogging seemed not that important. It’s been one hell of a ride! I’ll do a quick run-through of everything in hopes I’ll write a longer post for each place in more vibrant detail (and with some pretty pictures too!). Retrospect is a funny thing. I remember writing how Laos was a weird one but when you look back on old times you only seem to remember the good things. I loved the elephants, the mountains, the sheer beauty everywhere I looked and the bakeries. We flew from the quietest airport I’ve ever been to, Luang Prabang — from boarding the plane to taking off within 15 minutes. Flight time was about 50 minutes and was great. The clouds looked like candyfloss and we even got an inflight meal (albeit rushed). Touchdown at Hanoi’s airport, pick up a SIM card and get transferred to our hotel. Drop off the backpacks and head out for food. The place is heaving. Traffic everywhere, street food galore. This is far removed from where we just came from. We find a place next to the train tracks, sit on the children-sized stools and blindly order whatever it is they sell. The guy comes out with a portable stove, frying pan wrapped in foil and plates upon plates of raw meat and veg (and a few little extras too). It gets lit up, we start cooking and before we know it have already fall head over heels in love with Vietnamese cuisine. The rest of the time was spent walking around exploring the streets and markets and tasting what else was on offer and holy crapdogs I discovered Vietnamese Coffee. It’s incredible. Hanoi is also where I truly learned how to fearlessly cross a road of non-stop oncoming traffic. Next stop was Hué (pronounced Hwey). We took a sleeper train there (14 hour journey? ), it wasn’t as nice as the one from Bangkok to Chiang Mai but it wasn’t that bad. We both had top bunks (always, always, ALWAYS try and get the bottom ones!) which meant we were stuck laying down for the majority of the trip. This train has 4-berth cabins and has a door that closes and if needed, locks, all four passengers in the room. We were bunked with other travellers so not all bad. WEYHEY! We arrived safely and almost instantly regretted our decision to stay for 5 nights after everyone we spoke to who asked how long we were staying said “Woah! That’s a long time.” and that’s coming from the people who lived there… even our hotel when we checked in. We reduced it to 2 — not that it wasn’t a nice place but because there wasn’t much to do. We took a 3-hour train ride from Hué to Da Nang. Whilst waiting for the train in the station we had a few photo-ops with some Asian peeps who really wanted a photo with us. We thought it was a bit odd at first but soon realised that it was likely because we are just too damn awesome for people not to have their photos taken with us. The train ride was okay. The blanketing clouds seemed to not want us to leave Hué as they started crying for the entire train ride. We rode round the mountains and saw our first glimpse of the sea from Vietnam. We stayed in a hotel called The Finger. Innuendos aside it was a scenic place to stay. Our hotel was really far away from the city but really close to the beach. It was wet and cold so that didn’t work out too well for us. This was made up to us by being placed on a high floor looking at the colourful homes below us. If we were in the city the view wouldn’t have been nearly as humbling. 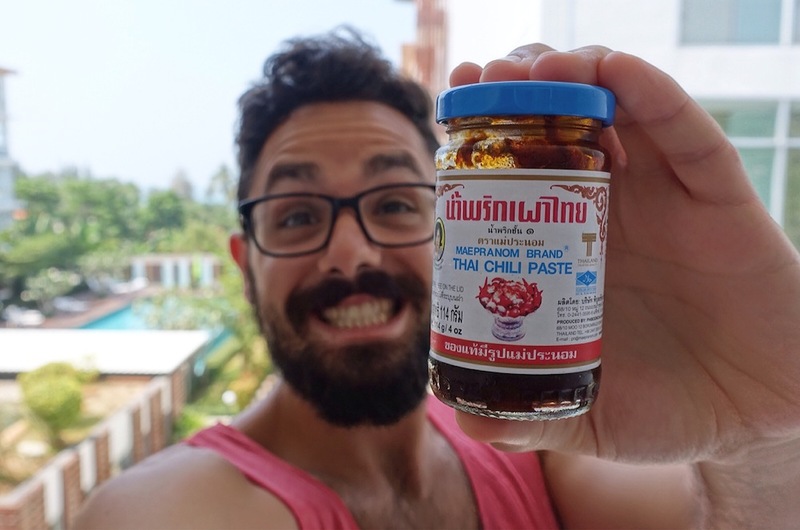 We explored the city (taking a taxi there) and decided to do the long walk back, over the Dragon Bridge (where a mother and daughter pulled over their moped to get a photo with us… not even making this up), through the streets of the homes we overlook. Such a different vibe from one side of the river to the other. More markets, more walking, more colours, more smells. Beautiful. Time to take the taxi to Hoi An. It took like half an hour. Really close, nothing to report. Now, for travellers who like exploring places on foot, this is an ancient city made for walking! Aside from the barrage of women who follow you asking to take a look in their shop (only down one or two streets), this is a lovely place. The cakes, the coffee, the lack of scooters and cars and oh man, the Vietnamese doughnuts! Ring doughnuts, red bean filled doughnuts, coconut (real, shredded coconut) doughnuts, peanut (real, crushed up peanuts) doughnuts and the not-to-be-forgotten deep fried banana pancakes. Also more Vietnamese coffee. Damn that stuff is good. We walked along the river, visited the night market, ate at an amazing restaurant (Vy’s Market Restaurant & Cooking School), rode bikes to the beach (still cloudy but the first beach of our journey!) and then headed back to Da Nang to board our next sleeper train. Same 4-berth cabin, same top bunk situation. The only changes were our fellow bunk-mates below. A few times actually and this time locals, probably commuting. Also I saw a mouse peeking at Charlotte from the luggage storage by her head… for the sake of a good night sleep I didn’t tell her until morning (and I made sure it was gone because I’m an amazing travel buddy). The locals call it Saigon, I call it a place for some retail therapy! Shopping malls galore and with Christmas approaching what a better time to hit the shops. After the disconnect from good old materialistic capitalism I needed an prebuilt ecosystem of commerce and eating. We browsed the shops and enjoyed the artificial lighting but in the end the only things we bought was junk food were food related items. We were there for Christmas and we heard that Christmas Eve was celebrated by the Notre Dame Cathedral. They weren’t kidding! Hundreds, no, thousands of people lined the streets. Cars jammed in human traffic, people with spraycans of snow, vendors selling food. It was great! That is, until the spraycans of snow were turned on us. Kids chasing each other with cans, spraying and laughing. One sees us and for whatever reason gives a cheeky spray, cautiously waiting to see our response. We laugh, he does it again. Oh, and now his mate does… oh look, there’s like 5, wait, 10, oh crap… 15 or 20 kids surrounding us spraying snow! Not at each other, just us! All in good fun of course. We escaped with massive smiles and somehow a celebrity status as girls and boys pulling is left and right to get photos with us. Like, really, what is it with all these photos? Then we hit up Dunkin’ Donuts for some good eats getting a lot of looks questioning our moist appearance. Christmas Day rolls around which is a weird one when you’re not with family. The receptionist calls us and tells us they need to come in, we’re curious as to why but seconds after hanging up the phone there’s a knock on the door and two extremely happy Vietnamese girls. “Merry Christmas!” They roar as they stampede into our room with a plate of fruit, a luxurious looking box, a bottle of champagne, a rose in a vase and a letter we’re not allowed to open until they leave. Still dazed and confused I open the letter — those cheeky monkeys — miles away from home and my family still surprise us with gifts on Christmas. Inside that box was some classy cheesecake with Merry Christmas written on it. It tasted so good and maybe the champagne was thinking for me but I really missed home. We explored the city more, walked by the river and checked out some local cafés, took countless selfies with Christmas Tree’s, visited the War Remnants Museum (recommended if you’re near), ate more doughnuts (or donuts) and then prepared for our next country. Cambodia. We boarded the coach and settled down for a 6/7 hour coach ride from Vietnam to Cambodia. We go through the border, a lot of standing and waiting and such, finally get Ito Cambodia and stop for lunch. Get off and go inside a terrible place with terrible food and terrible people, pay over the odds for chicken and rice (and crushed up bones), pay, don’t get change, ask for change, “tip!”, I say “no tip!”, get change, give a tip, have it ungratefully laughed at (but still taken), eat, board the coach and hope I don’t get food poisoning. Half way there we get pulled over for a random police security check, an hour of worrying after we’re on the move again and get to our accommodation above Jay’s Diner. We arrive, settle down and get out for some food happy to reach our new destination. We find a place to eat and strike lucky as it’s really good, unfortunately I receive some really bad news and try to hold it together for the rest of the night. The next day we visit the Killing Fields and S-21 Genocide Museum. Interesting, moving, heartbreaking and inspiring. If you’re in Cambodia I’d suggest going out of your way to visit those two places. So far Cambodia hasn’t been the happiest of places, in fact, it’s quite eerie. The rest of the time was spent exploring, visiting night markets, eating, drinking and booking our bus ticket to Siem Reap. Cambodia doesn’t have trains and we’d heard the buses are okay and the roads are fine. Liars. The internet lies! Who knew? Long story short and I’ll definitely be posting the longer story up — we almost die when our double decker coach drives off the road, down a hill almost tipping! We get stuck at a 45 degree angle thankfully because of a small mound that got wedged under the front bumper. We hitchhike the rest of the way with two Australians (thank you for stopping! ), two Germans, a Russian, an Italian and a Dutchman. The driver tries and stops us from leaving but we had a hard time trusting the coach before it left, let alone now. We stop for food enroute and get to Siem Reap. We arrive in Siem Reap (barely) and Charlotte gets her stuff stolen. I don’t know why but Cambodia really doesn’t like us! We ask the hotel staff a out the police and they say it’s closed until morning so Charlotte does what she can (blocks her sim, sets her devices to auto format when they connect to the internet). It’s not been a good day. The next day we go to the police station to get this sorted. We go in, start talking, I get asked to leave, Charlotte gets interrogated by three Cambodian police officers shouting at her that they “DON’T BELIEVE YOU!” because she can’t prove she was pick pocketed. They refuse to file the report even though they write it out and refuse to investigate further. Today isn’t so good either. I email the UK embassy in Cambodia. No help either. The next day we get and recover by the pool and relax before visiting Angkor Wat on our last day in Cambodia (also New Year’s Eve). The next day we fly to Bangkok because screw getting anymore Cambodian busses! Flying was pretty scary as well as more Asian planes went missing a day or so before. Flight time was about an hour. We land in Bangkok and don’t make the same mistake of booking a taxi inside the airport like last time and instead go outside and get a taxi from the taxi rank (still convincing them to turn on that damn meter!). We decide to stay closer to the action this time. The first place had no windows and terrible service so deciding we want to stay in Bangkok longer move out and check in to a 5 star hotel for a change — The Berkeley (always check hotel websites directly, I got a cracking deal). Another reason for the lavish accommodation was for a solid internet connection and some extra space to I had some freelance work come in. Bangkok consisted of poolside pizzas, shopping mall exploration, Starbucks, work and room service. I love room service. These things can’t last forever though which is why we decided to head over to Phuket. Only animals and insects are supposed to flap their wings to fly — imagine my surprise when I look outside of the plane window and seeing it think it’s a bird! The turbulence was horrific for the entire journey. Landing was cool though as we come in so close to a beach that you think it’s going to land on it. It doesn’t. Still lands on a runway. We check in at the AllStar Guesthouse which is in the perfect just-off-the-main-road location and has a really great host. We’ve finally landed somewhere consistently sunny! We get drunk the first night and explore the markets a little. The rest of the time was spent eating, sunbathing and swimming in the sea. We were by Karon Beach and we’re lucky enough to watch the sunset over the sea while laying on the sand. Southern Thailand wouldn’t be Southern Thailand if we didn’t visit an island so we head to a still relatively untouched place called Koh Yao Noi by speedboat. We left our guesthouse and caught the local bus to Phuket Town, from there we were asked by everyone where we were going and everyone pointed to the same bus (by bus I mean small truck with two wooden benches drilled either side in the back). Finally get to the pier, and pay the little extra to take the speedboat over the Longtail boat to Koh Yao Noi. We arrive and get taken to Suntisook Resort. We get a little wooden hut, no AC, mosquito nets above the beds, hammock outside. This place is great. It’s such a modest hut and there’s nothing to do unless you hire a scooter and drive a while to the town. The family who run the resort have a restaurant which we ate at at least twice a day and after eating there and hiring a scooter and eating at the rusty table of a vendors house I can honestly say that it is the best tasting food I’ve had in Thailand. Roasted Duck Soup, Noodle Soup with chicken, vegetables or shrimp, Papaya Salad, Massaman Curry with steamed rice. Urgh. Incredible. Our hut was just on the other side of the road to a beach which overlooked mountain islands in the distance, when we found out that the sun rises behind them we made sure to wake up extra early to catch it and I have to tell you, it was the most beautiful sunrise I’ve ever seen in my life. Koh Yao Noi is a tiny island where the people are mainly Muslim. It’s just north of Koh Yao Yai and is still untouched. The people are friendly, the food isn’t westernised, there’s not a lot to do so relaxation is at a maximum. I doubt it’ll stay this way for long as once everyone gets wind of it it’ll end up like the rest of the tourist inhabited islands. Actually, I should probably just delete this whole section. The Longtail Boat is a wooden boat driven by an engine in the rear which has a long pole coming off it with a propellor on the end that drives the boat. 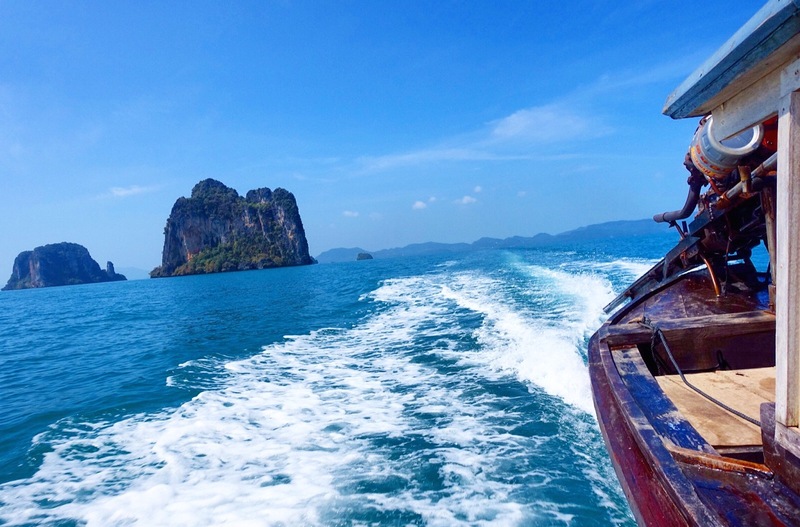 We had the pleasure of boarding it and riding up close and past those distant island mountains that we saw from the shore as we made our way to Krabi. This is where we currently are, staying in a nice condo with a balcony that sees the sun set. We’re a walk away from the main areas but it’s nice. It’s peak season here but it seems really quiet still and the prices compared to everywhere else are the highest for food and drink at the restaurants. Lucky for us this is the first place that has cooking facilities (and a rice cooker!) which we’ve already taken advantage of. We’ve taken a long walk along the beach, seen hundreds of tiny crabs (is that why it’s called Krabi?!) and are excited to beach it up while we’re here. From here we head to Kuala Lumpur, Malaysia before landing in Singapore where we’ll leave South East Asia and start the second half of our journey though Australia, New Zealand and the USA. One last thing — I try and upload at least one image a day to my Instagram which makes it the most up-to-date place to follow me around the world. So what are you waiting for? Follow me!